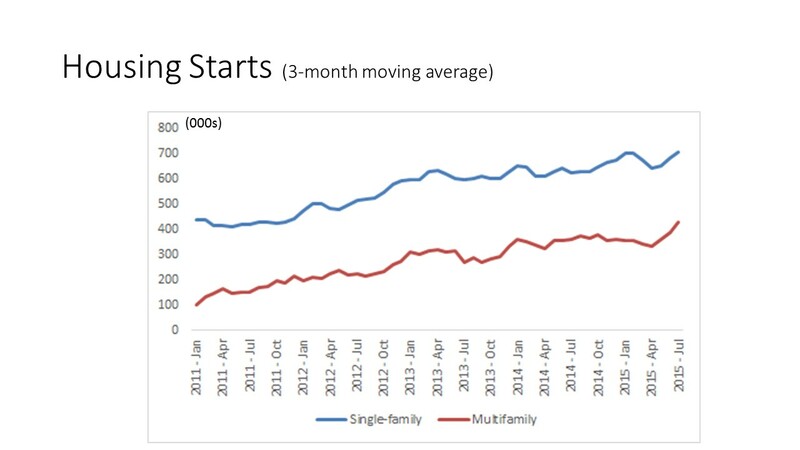 July housing starts moved sideways, but the split between single-family and multifamily showed much greater change. Single-family housing starts increased almost 13 percent from June and topped the highest annualized rate since January 2008 when home buyer credits were available. Removing some of the monthly aberrations, the three-month moving average has been steadily increasing since the trough in 2011. Multifamily starts moved in the opposite direction because of a unusually high level in June but also continued on an upward trend when comparing a moving-average that now tops over a 400,000 annualized rate. Permits fell because the June level was unrealistic high, partially due to an expected code change in New York that pushed multifamily permit draws into June. Total permits declined 16.3 percent to 1.1 million per year as single-family moved sideways to 679,000 per year but multifamily dropped 33 percent to 440,000 annually. The three-month moving average remains above 500,000 annually, which is well above the averages of the 1990s and early 2000s. The July report rebalances the movement of multifamily toward some leveling in total production and continues the modest but steady progress in single-family production. Renting will continue to enjoy strong demand as most newly formed households are unable or unwilling to buy a home. But single-family construction will also continue its modest improvement path as more existing home owners gain comfort in their own economic future and earn more equity in their current home to move forward to a new home. Builders remain concerned about access to affordable lots and skilled labor. Attracting more labor and lot development to the industry will require builders to pay more for those supplies and will continue to increase the cost of new homes as existing home values also increase. The lot scarcity issue has been around for awhile, what do you think will drive land holders to develop more land for the homebuilders?